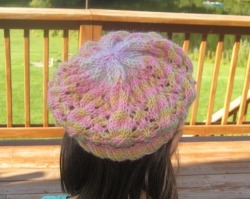 This Beret is fun to work with. 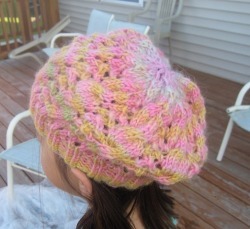 The sample of the Kimiret is in size S and worked using Peoms by Wisdom Yarn. 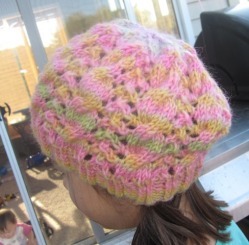 You can use any worsted weight yarn to substitute Peoms. wearing size S in the pictures. M should fit most teen; however, if prefer to have a loser fit, then choose size L.
One 29 inches or longer US 8/5 mm circular needles or size to obtain the gauge to work the crown using magic loop method.